Pro-Lam Alluminio has developed a totally new thermal break system for 45 mm panel. 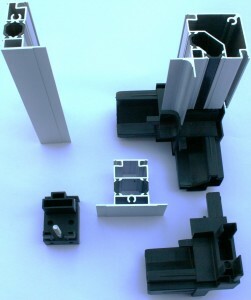 The feature of the new thermal break system is the new range of profile, named “panel stop” profiles. Those profiles hold the panels without the use of screws and the result is an easy and fast assembling. Thanks to this “panel stop” profiles the system require sandwich panels (low cost) instead of bended sheet version.The aluminium frame has internally radius corner with radius nylon corners: this characteristic helps to maintain the cleanliness inside the unit. Another important feature is represented by the special gaskets: these gaskets are in PVC and they ensure smooth internal surfaces in between panels and profiles inside the unit for sanitized solutions. Moreover, to improve the mechanical and air tightness property of the frame, the nylon and omega joint corner have special grooves for screws that fasten together the aluminium profile with the plastic components.